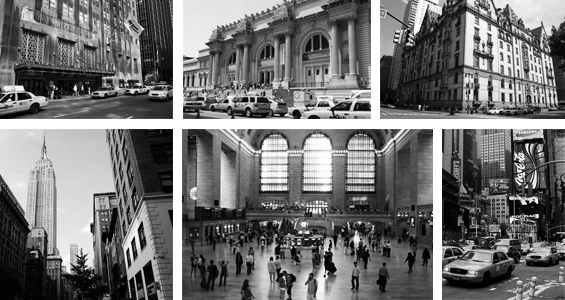 For anyone planning a trip to NYC, otsoNY has compiled a list of the most essential film locations. 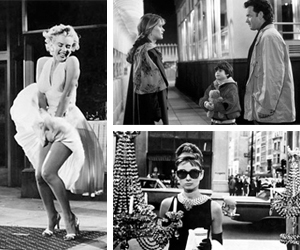 On the Set of New York.com presents a collection of the most famous, distinguished, unforgettable and memorable film scenes shot in New York City. From "Breakfast at Tiffany's" when Audrey Hepburn as Holly Golighty, still wearing a Givenchy evening dress from the night before, staring dreamily into gem-filled Tiffany's window as she consumes a breakfast of take-out coffee and a Danish - to - "Vanilla Sky" where Tom Cruise as David Aames finds himself completely alone in Times Square. For anyone wanting to photograph the famous New York City skyline, and can't afford a bird's eye view from a helicopter, the 2nd best vantage point is from one of the many skyscrapers, of which there are three offering observatories; the Empire State Building on Fifth Avenue between East 33rd and 34th Streets; the Rockfeller Center, better known as Top of the Rock on 50th Street between Fifth and Sixth Avenues; and newly opened One World Trade Center. New York City has many famous buildings and places such as the Empire State Building, Grand Central Terminal, and the Mall in Central Park, of which have appeared in many films and have an interesting history. Click the link below to find out more. Studio 54 was a notable disco in the 70s and early 80s. Studio 54 was originally a New York City Broadway theatre, then a CBS radio and television studio. In the 1970s it became a busy discothèque located at 254 West 54th Street in Manhattan. The club opened on April 26, 1977 and closed in March 1986. Since 1998, it has been a venue for the Roundabout Theatre Company. This chart is compiled from the current list of films showcasing on otsoNY. Surprisingly, actors such as Sarah Michelle Gellar, Heather Graham, Bill Murray, Jack Nicholson, Tom Cruise, Jennifer Garner, Dustin Hoffman and Jessica Alba all missed out on a chart position due to the competition being so strong in regards to the quantity of New York based films each actor had featured in. In association with PopSpots.com, otsoNY presents Record Cover Locations; a page purely dedicated to iconic album covers that have been transposed onto modern-day photographs detailing the actual location where the picture was taken. 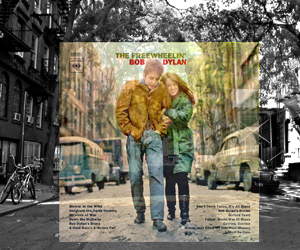 Featured artists include Bob Dylan, Neil Young, Billy Joel and many more from the 1960s and 1970s. New York City is the most populous city in the United States, and the centre of the New York metropolitan area, which is among the most populous urban areas in the world. A leading global city, New York exerts a powerful influence over worldwide commerce, finance, culture, fashion and entertainment. This website is hosting a special selection of photographs taken in New York City.